Many people who are looking for a way to get on the water find themselves caught between a boat with expensive maintenance and repairs or a clumsy, unstable kayak. 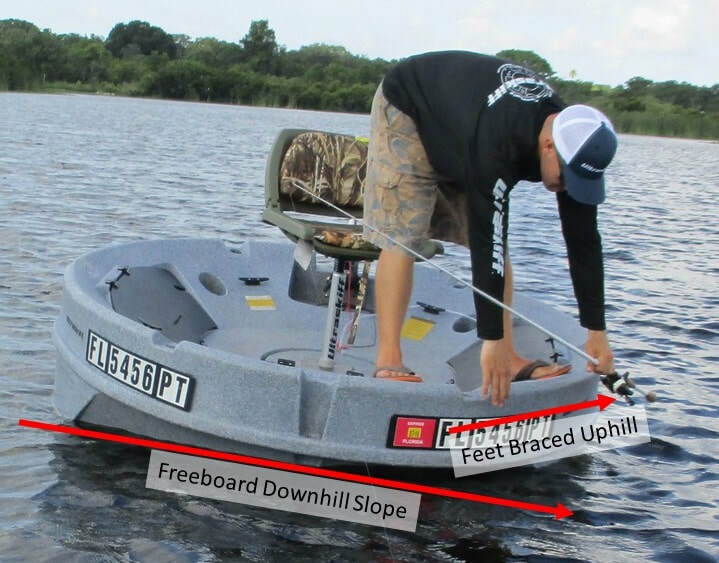 How can you get something that does not require a boat ramp to launch, is portable enough to move around without a dolly yet can achieve the fishability, hidden storage and elevated vantage point of standing or sitting on the deck of a boat? Achieving alpha is about the search for balance, not absolute perfection. 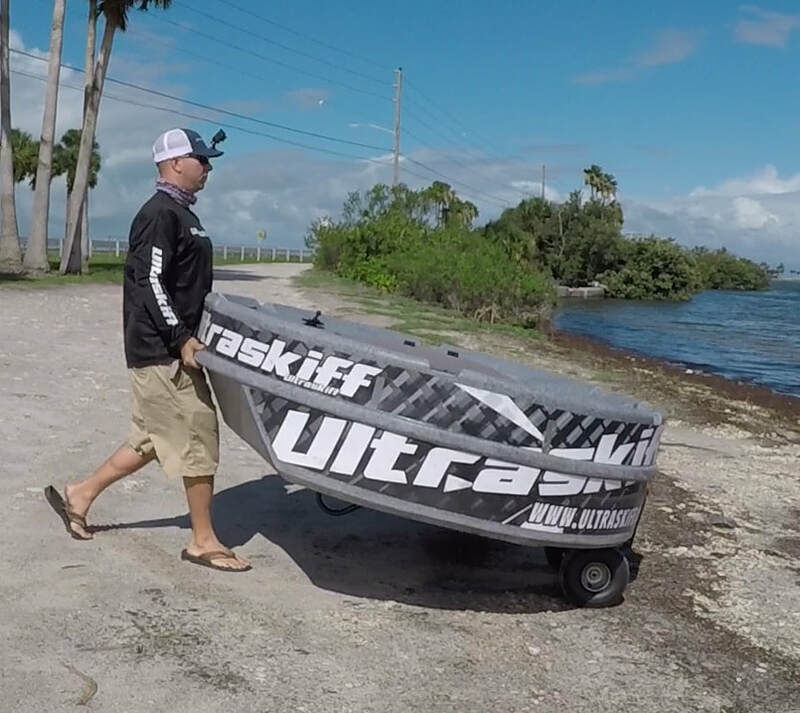 The Ultraskiff achieves that balance with a platform you can launch for quick 2 hour session or pack a lunch and spend an entire day without any discomfort. The on the water experience is unique unlike any other craft on the market. 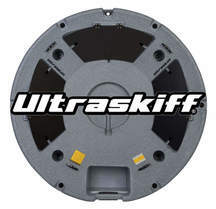 Continue reading below for an in depth look into what makes the Ultraskiff special. The 360 Degree Fishability that comes from being in the center of a round platform feels like you become the boat itself. Yet, thanks to gravity, an occupant standing outside of the center will always tilt the platform downhill while having to balance him/herself to the equilibrium of an always shifting platform. We addressed this by merging the gunwales, outer deck and hull into a surrounding inverted landscape. This creates a lower, more controlled center of gravity and a unique self stabilizing effect on your balance, equilibrium, stability and overall confidence when standing, kneeling or enter/exiting the platform. On our first trials it was amazing just how confident we felt interacting with this part of the boat and how your feet ergonomically matched the surface while sitting, allowing you to exert outward pressure with your feet from virtually any seating height or position. 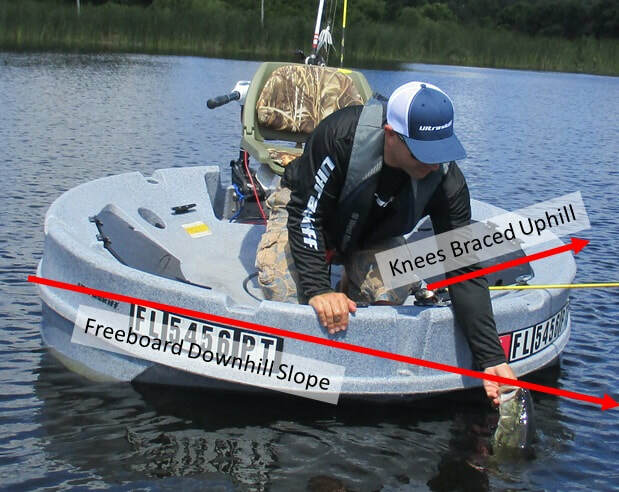 If you need to make a firm hook-set, keep the boat aligned with a fighting fish or turn in your chair while sitting on a high perch your feet will instinctively reach outward for support. 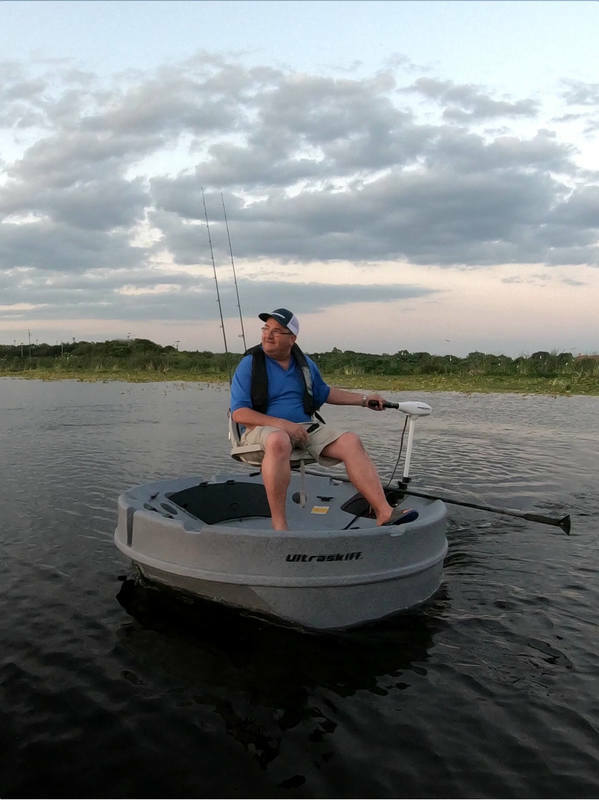 Standard seats (low range), Barstool seats (mid range) and casting seats (high range) all work great with the Ultraskiff, essentially making the watercraft 3 boats in one, allowing the user to choose/change their experience. 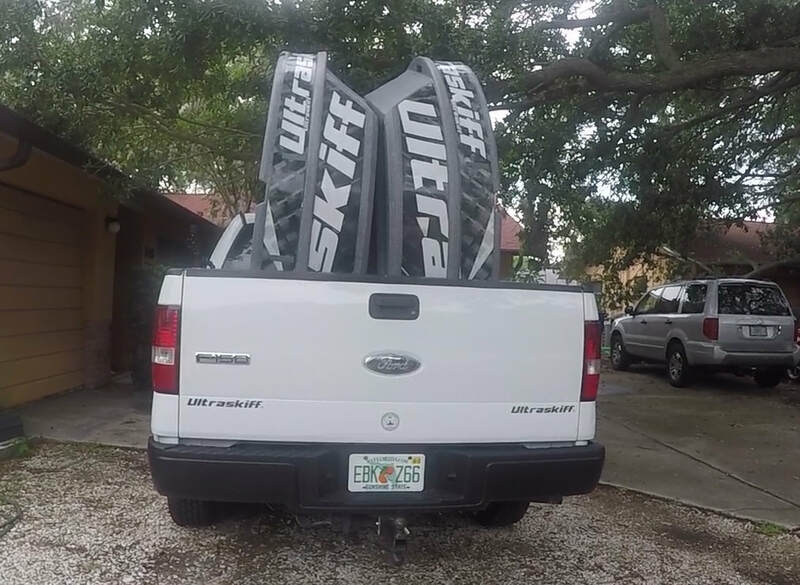 The Ultraskiff is stuffed with accessories and features like an Anchor Pin Slot, Bow Handles, 8 Strap Guides, 4 Cleats, 4 Bottom Utility Inserts, 5 Skegs, 4 Ram Mount attachment inserts, Bumper/Roll bar, 3 Large High Compartments and a battery compartment. 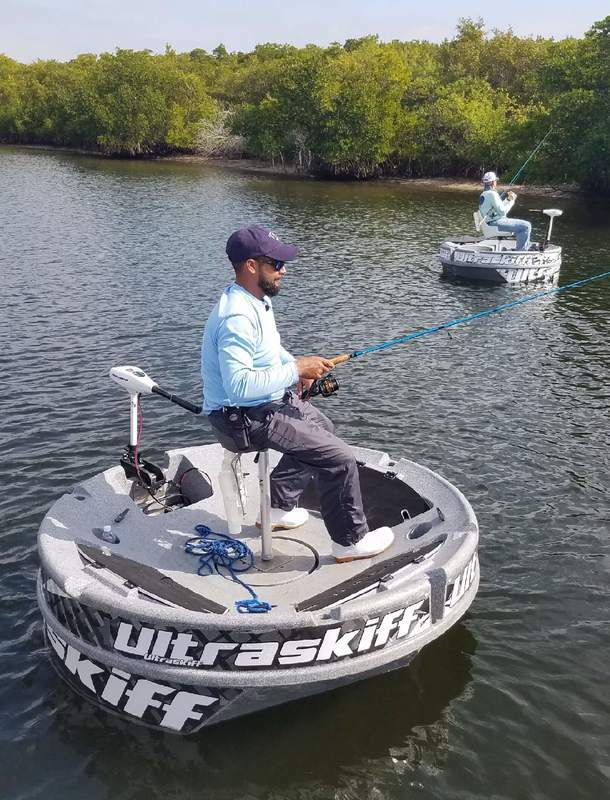 Yet, the Ultraskiff takes it a step further by giving the user the ability to use PVC to create a myriad of custom accessories while bypassing the outrageous costs of custom accessories many manufacturers force you to buy. We have made a collection of demonstration and instructional videos related to after market accessories and D.I.Y. 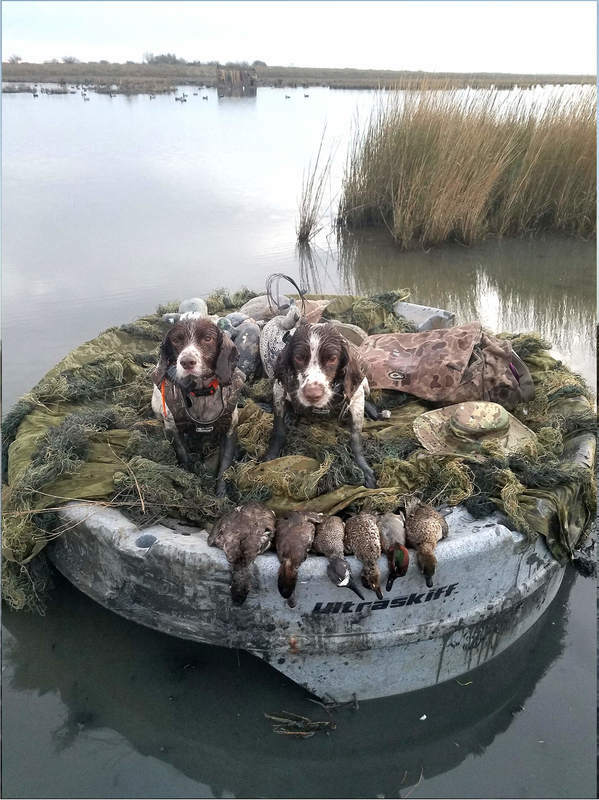 accessories that you can build for the Ultraskiff from Ducks Blinds to Custom Rod Holders. Check out our Specs and Features as well as our Accessories Video Gallery. 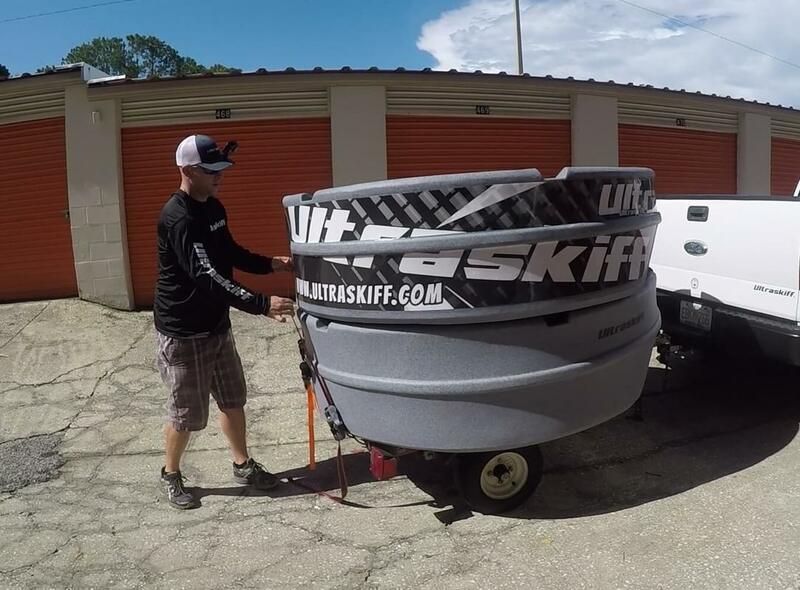 The ability to roll the Ultraskiff like a wheel is a one of a kind innovation and feature in the marketplace. 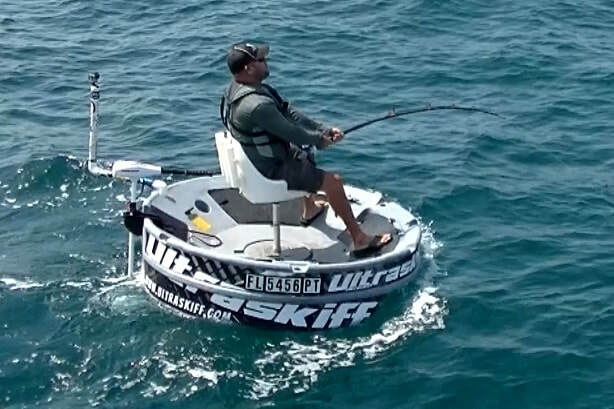 Our proprietary Bumper/Roll-bar on the Ultraskiff forces minimal contact with the ground and enables the boat to roll over the prow and complete the rotation. The Bumper/Roll Bar also allows the Ultraskiff to slide on its side thanks to the minimal ground contact. Sliding is a great way to move the boat on hard surfaces like docks or the floor in your garage. 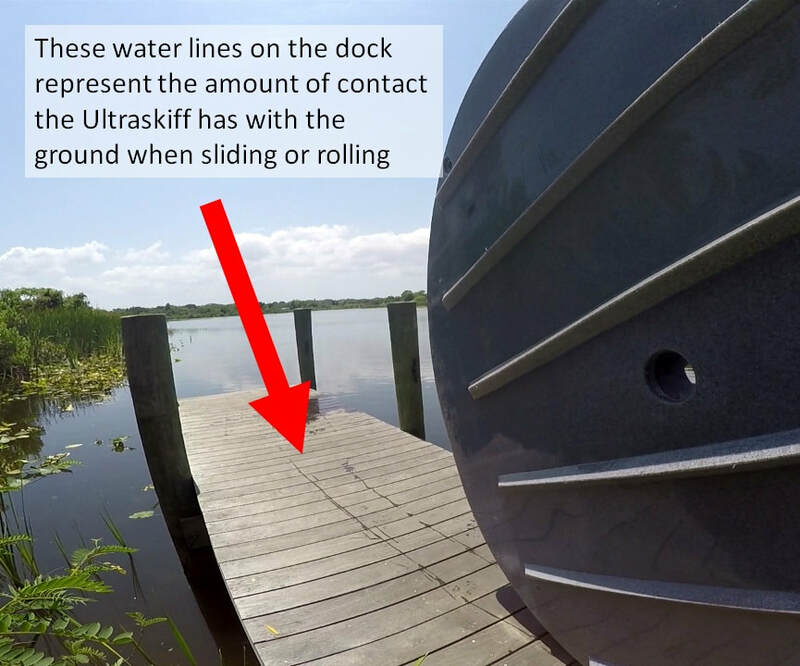 We have a collection of demonstration videos in our gallery that show the proper way to roll the boat on a variety of surface types as well as a series of "tough launch" videos where we show what it is like to launch the Ultraskiff without a a dolly in tough situations. One of the best features of our design and perhaps the least talked about is the lowered flare on our bow. It is essential to creating stability in rough water and keeping that water from coming over the bow and into the boat. When the Ultraskiff motors into a wave or a swell the water moves upwards until it hits the bow flare. The Ultraskiff puts that flare at the half-way point rather then at the top. This allows boat wake or rough chop to hit that lowered flare and deflect back down to the water, in the process it is also lifting the front over the crest of the wave itself. Watch our Boat Wake demonstration videos to see this element in action. 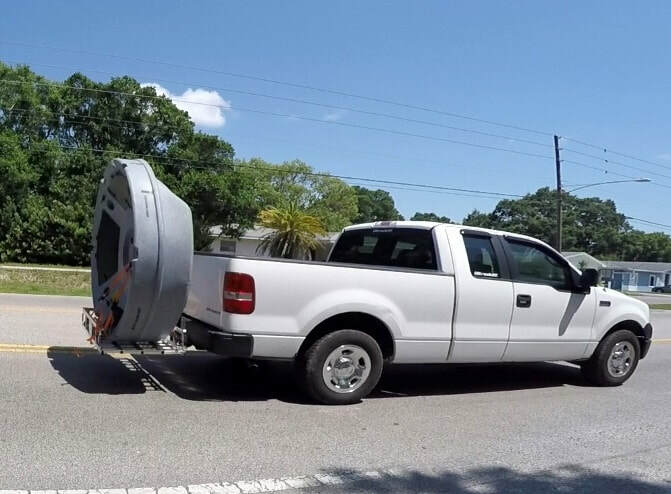 Transporting the Ultraskiff by vehicle is one it's best abilities thanks to the 5 deep strap guides along the gunwales and a large center hole that is made completely accessible thanks to our detachable pedestal mount. 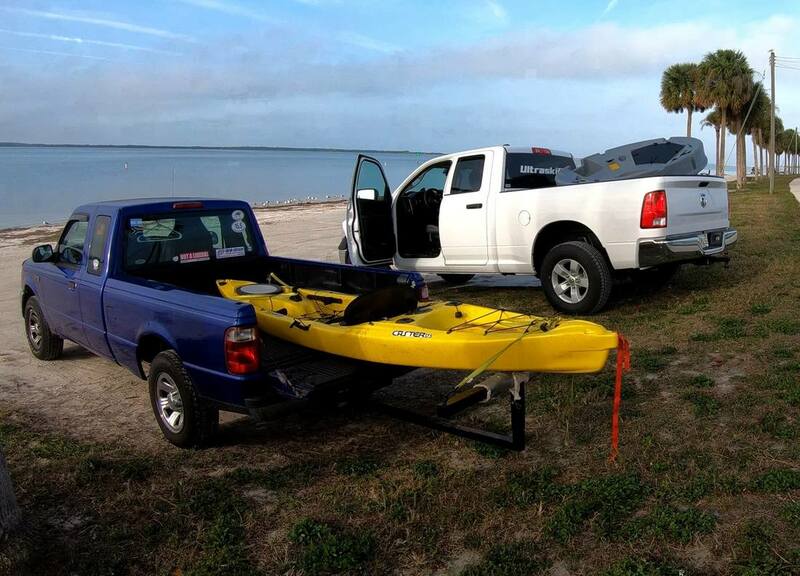 With a 6' diameter you can fit one or 2 Ultraskiff's fits into a truck bed. If you have a short bed it works the same way even if your gate is not closed, you just have to make sure you run at least one strap through the center hole. 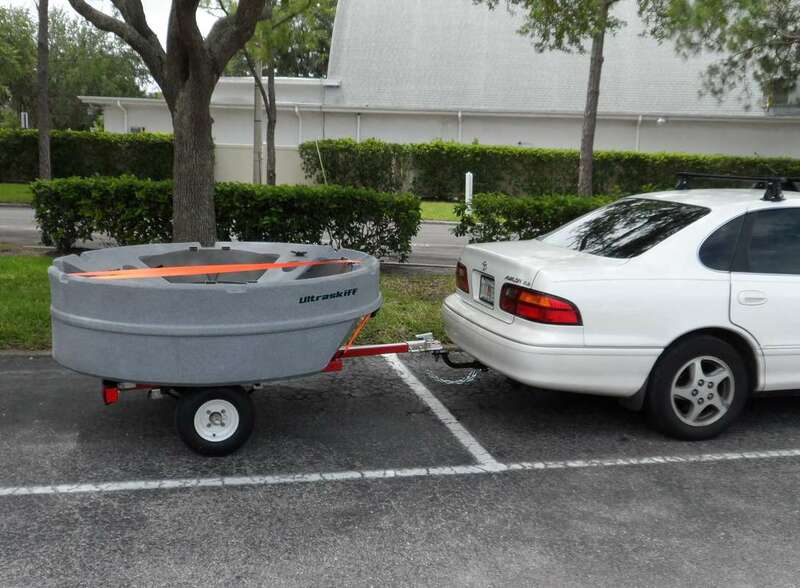 Small watercraft or utility trailers also work great and the Ultraskiff is stack-able for transporting 2 Skiffs. Transporting with a wheelchair or cargo carrier is also an option if you are looking for a way to park your vehicle without a trailer. 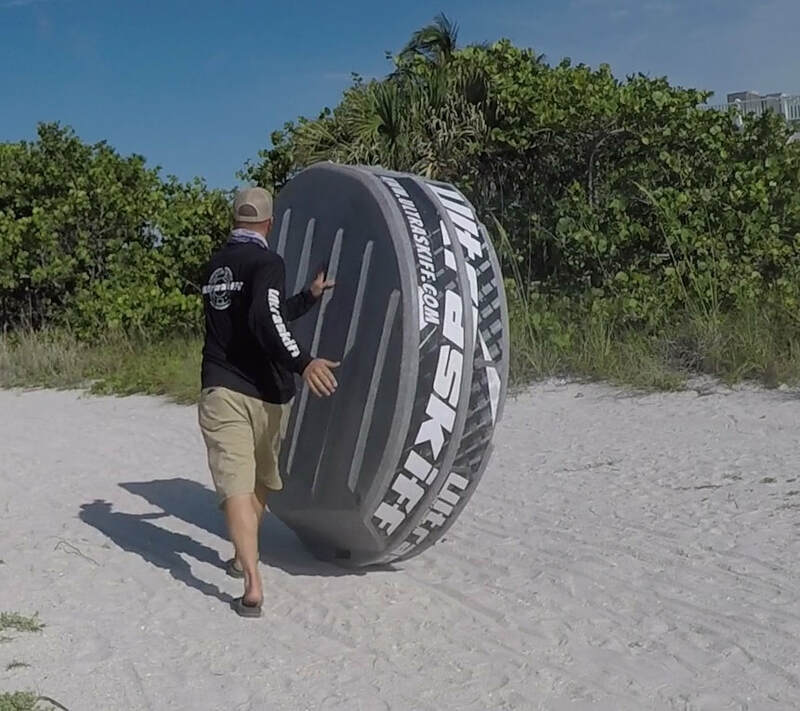 Watch our video below where we demonstrate how to strap the Ultraskiff into each of these transporting options. Our Patented Detachable Pedestal Mount easily pulls off the deck, making the boat lighter and exposing the large center through hole. 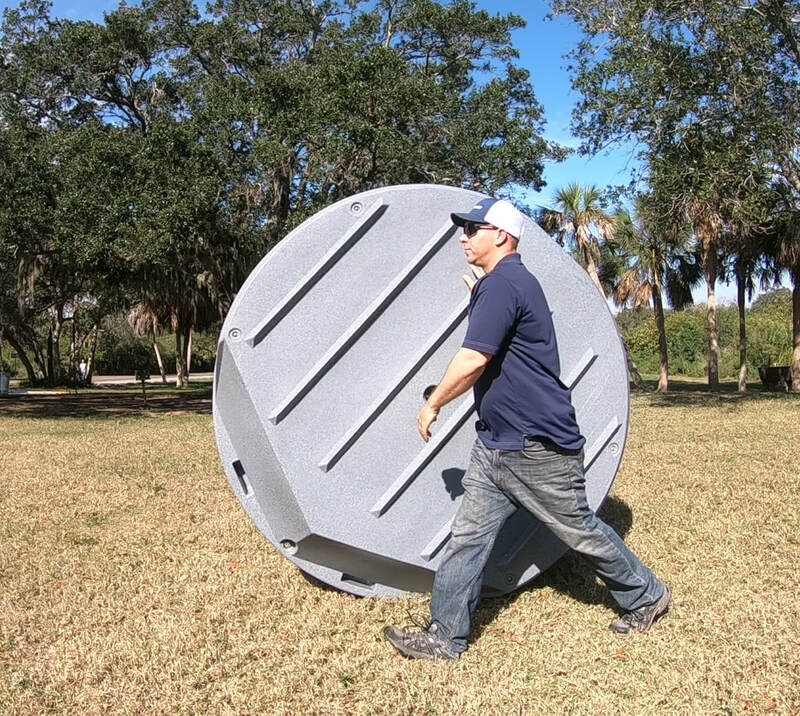 This center hole allows the user to fit their entire hand through one or two boats at once for security locks and strapping down for transport vertically or horizontally to a truck bed, cargo carrier or trailer. 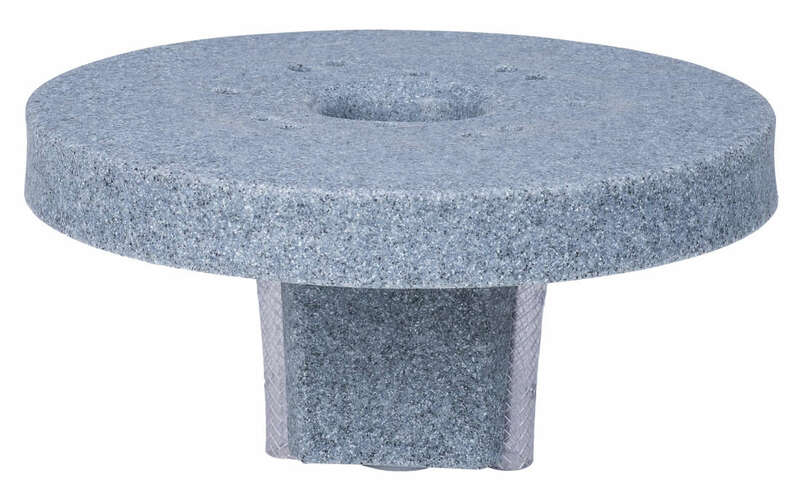 The detachable pedestal mount has a 16 Hole Pattern that is compatible with both 7" square and 9" round shaped pedestal bases making the Ultraskiff compatible with virtually every single type of seat pedestal system on the open-market. When removed it makes the boat lighter to handle and keeps your seating hardware separated from the elements. The detachable pedestal has shock absorbers that separate the plastic hull from the torque and pressure derived from the fulcrum of the seat pedestal, preventing potential stress fractures in the plastic hull.